Mindset to rethink: Lights, Camera, Action; sight and worship! Sight is also a powerful tool in worship since Jesus is the Light of the world. Without light there is no sight, only darkness. Even the smallest flicker of light from a single candle in a large dark room can penetrate the darkness. One ray of light piercing a darkened sky brings attention towards its creator. 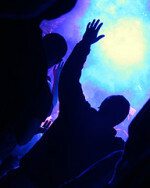 Worship puts the “spot light” on Jesus, and light is a spectrum of colors. When we enter the His Presence, Jesus, the Light, reveals the spectrum of light producing powerful supernatural images about Himself. The Glory of the Lord is the light of Jesus. Einstein’s theory of relativity is an attempt to prove that if one travels “the speed of light”, time stands still; all time is in the “present”. All days are “today” in the kingdom of God. God’s Presence is always in the present, for he is the “I AM”! All this, just through studying light! Sight is crucial to worship? Sight can bring revelation. Once I was blind; but now I can see. Bring on the supernatural sight of revelation when in Your Presence, Jesus! Older PostMindset To Rethink: Is Silence A Mark Of Reverence?